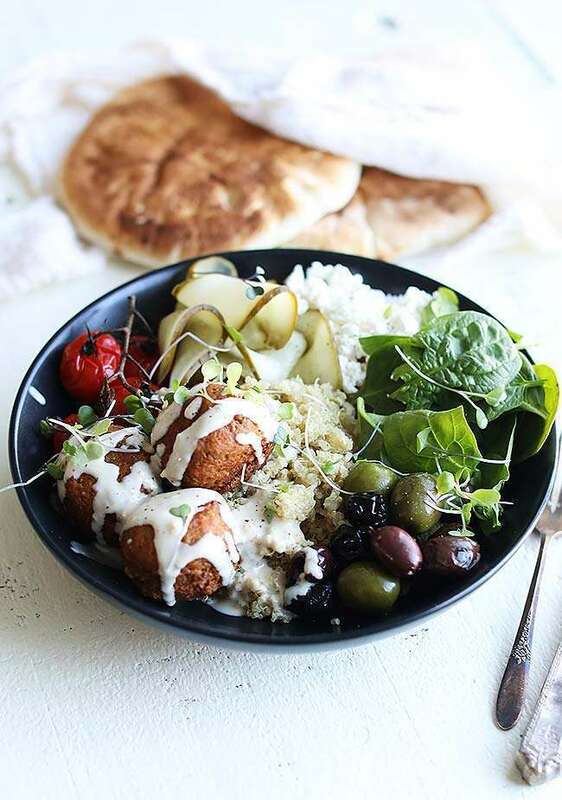 Mediterranean Quinoa Bowl Recipe with Falafel and Garlic Tahini Sauce – Take your weeknight meals to the next level with this Mediterranean Quinoa Bowl Recipe with Falafel and Garlic Tahini Sauce that is loaded with everything that goes into a falafel sandwich. From pickles, to feta, to spinach this falafel bowl is absolutely to die for! Every single time I make falafel at home I always say to myself WHY do I not make it more often? I mean it is just so delicious and so incredibly easy to make that it is a no brainer to make! This Mediterranean Quinoa Bowl Recipe with Falafel and Garlic Tahini Sauce features tons of delicious flavors that are sure to satisfy your Indian/Mediterranean craving! I have to admit that I like my falafel recipe over most restaurants simply because I season it. Something as small as salt and pepper goes a long way, but when I eat falafel in a restaurant I am always dumping tahini sauce all over it so that it tastes like something. Most of the time I get an over cooked really dry falafel that has no flavor and was probably cooked early in the morning and put under a heat lamp all day until I order it. Well maybe that’s not exactly the case, however, my falafel is better! I believe the folks in the Mediterranean area would be happy with my falafel :-). I do have to admit then the first time I ever made falafel, way back in my restaurant days, I made it from canned chickpeas and once I fried it, it completely fell apart in the oil. I was so flippin mad! I should have put some flour in there and I knew it but didn’t. Fast forward 20 years and the real secret is not to use canned chickpeas. No, it’s to use dried chickpeas that are reconstituted. You see canned chickpeas are cooked and soaked making them dang near impossible to hold together because there isn’t much left to cook. I used Bob’s Red Mill dried chickpeas which honestly are perfect for falafel, as is all their products for whatever your need may be. Once you soak them over night in water, drain them and toss them in a food processor with all the other goodness and pulse it until it becomes like a meal. At this stage try and think of what a pie crust might look like and you’ll be just about there. You want to from the falafel into golf ball sized, or smaller, balls that you fry up in some grapeseed oil around 375°. I like grapeseed oil because it’s on the healthier side and has a high smoking point, but you can absolutely use oils like safflower, canola or coconut, totally up to you. Once the falafels are golden brown and cooked through out, that’s the key make sure they are done in the middle, you want to drain them on a paper towel to get rid of any access oil that they are fried in. You want to keep the falafel warm while you make the garlic tahini sauce and the quinoa so you may want to keep them in the oven at like 140° just so they stay warm. Just a little FYI there for ya. There really isn’t too much to say about the garlic tahini sauce for falafel other than you putting everything into a bowl and whisking it together until it is combined. I guess the only thing you could watch out for is that tahini, or ground up sesame seeds, has a very strong earthy flavor to it and the only way to cut that is with the lemon juice. If you feel you need more lemon juice because the garlic tahini sauce is just to earthy, or bitter, then by all means add some more in there until it meets your needs. I always say you should recipes as guidelines and feel free to tweak where necessary. One of the things we have become obsessed with is quinoa. The first quinoa I ever bought was Bob’s Red Mill about 5 years ago because I remember hearing just how good it was for you and how it was a complete protein and an amazing supplement should you want to skip meat for a night. Well fast forward to now and we are still cooking up Bob’s Red Mill quinoa because it’s delicious, it’s loaded with nutrients and because we trust Bob with everything we put into our body. Simply serve the quinoa in a bowl alongside some sliced pickles, tomatoes, crumbled feta cheese, baby spinach, olives and the homemade falafel and garlic tahini sauce and that’s it. I think it would be cool to simply lay out all of the ingredients like a buffet and let your guests pick and choose what they want to add into the quinoa bow. If you want to wow some friends then for sure make this Mediterranean Quinoa Bowl Recipe with Falafel and Garlic Tahini Sauce, because honestly it only takes about 45 minutes to make. BOOOOM! If you love this Mediterranean Quinoa Bowl with Falafel recipe then you will love these bowl recipes! Take your weeknight meals to the next level with this Mediterranean Quinoa Bowl Recipe with Falafel and Garlic Tahini Sauce. Add the drained chickpeas to a food processor along with the onion, parsley, garlic, baking powder, cumin and salt and pepper and process until it becomes like a meal. Using your hands mold golf ball sized balls or smaller from the chickpea batter and set them aside. Heat the grapeseed oil in a large cast iron skillet over medium heat until it reaches 375°. Add in the falafel and cook for 1 ½ to 2 minutes per side or until golden browned and cooked in the center. Drain on a paper towel once they are done cooking. Tahini - Whisk together all the ingredients in a medium size bowl and keep cool until ready to serve. To Plate: Place 1 cup of cooked quinoa into a bowl and garnish with tomatoes, pickles, feta, spinach, olives, cooked falafel, tahini and micro greens. Serve hot.